As we approach Easter and the celebration of our Lord’s Resurrection, l would like to share 7 things accomplished when Jesus rose from the dead (largely spurred from studying I. Howard Marshall’s book: Aspects of the Atonement). Acts 2:22 says that Jesus proved who He was by signs and wonders. Throughout the Old Testament, there was a two pronged approach to testing the validity of new teaching. If it contradicted what came before, it was false, no matter what else happened (Deuteronomy 13:1-3). If it matched exactly what had come before, there was no need for a sign. If it was consistent with what came before, but went beyond it, miracles would verify. Jesus said that the sign He would bring to a wicked and adulterous generation would be the sign of Jonah (Matthew 12:39-40) – on the third day He conquered death. The resurrection shows that Jesus is a true prophet. In the Old Testament, when propitiation was made for some sin, God’s forgiveness was shown by the end of the punishment. When Phinehas performed a representative execution, the plague was lifted from Israel (Numbers 25:7-8). When the people cried to God, the judges delivered them from the oppressors they had earned. When David offered on the threshing floor, the Angel stopped His path of destruction (1 Chronicles 21:26-27). Each time, the sufficiency of the offering was shown by the end of the plague. In the same way, when Jesus rose from the dead, it showed that God had lifted the curse of death, because the penalty was completely paid. Jesus had been condemned both by the secular authorities (in the person of Pontius Pilate) and the religious authorities (in the person of Caiaphas). They had found Jesus guilty. Doubtless, prior to this many people had been executed for crimes they had not committed, but they were still sinners worthy of death (Romans 3:23; 6:23). Jesus being delivered from the power of death was God’s resounding acquittal of His innocent Son (Matthew 27:24). The powers of the universe in rebellion against God enjoyed an incredible control of humanity. Genesis 5:5 begins a sequence of the grim testimony “and he died” which is found nearly 100 times in the Old Testament. As Jesus took the power of death in His hand, truly the pallbearers came to a halt (borrowing language from Luke 7:14). Satan’s greatest triumph was turned into disaster, as the rising of the Lord Jesus showed that by death, the power of death was broken (Colossians 2:15). Easter was the beginning of a new world, a sign that the end has begun. All of the matter which now exists will be recreated, except the body of Jesus. When He returns in power and glory, we will be conformed to Him and ultimately the whole creation will be transformed by His resurrection power. Easter shows that on the first day of a new week, God began His new work – Jesus is the beginning of that creation (Revelation 3:14) and the firstborn of the dead (Colossians 1:18). As 1 Corinthians 15:42-49 reveals, we will take up the image of the heavenly just as we have taken the image of the earthly, what the entire universe groans for began on the Easter morning (Romans 8:22). A dead Lord cannot help us, but we have a living High Priest who is always available to work on our behalf. Hebrews 7:23-28 reveals that we have a High Priest who, through His resurrection, will never be unable to help us because of the scourge of death, but who is always available for us. As Job 19:25 tells us, we know that our Redeemer lives. Romans 8:34 puts it in similar language: if God is for us, who can be against us? 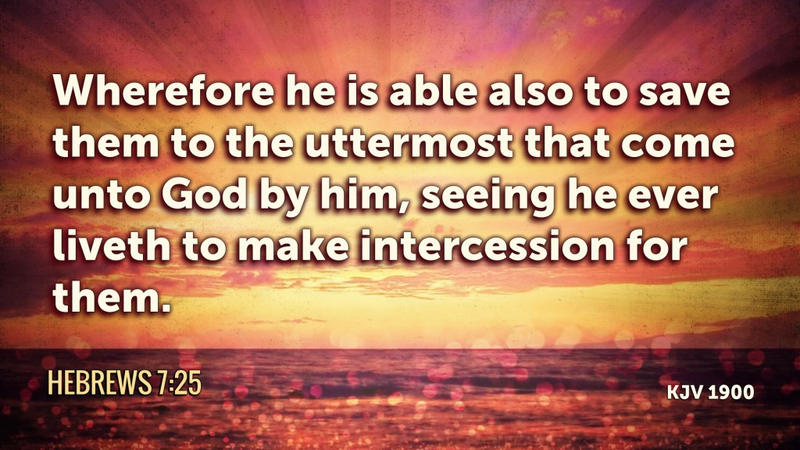 Jesus died and was raised, and always intercedes on our behalf. Jesus, as the second Adam, stands as the federal head of His people. In the first Adam, all were given a sin nature and made subject to death; all those who are in the second Adam are made like Him (Romans 5:14). As God found Jesus not guilty and lifted the penalty of sin from Him, we too escaped that penalty. Everyone who looks at Jesus’ suffering and death and rightly proclaims: “That death ought to have been mine!” and places their trust in Him is united to Him. If we are united to His death through confession of sin, we will be united in His life (Colossians 3:3-4; 2 Corinthians 4:10). In Easter, the innocent Jesus was pardoned in our guilty place. Justified in Him are we. Living Lord and coming King.